Meditech International is a vertically integrated biotechnology company founded by Fred Kahn, MD, FRCS(C) in Toronto in 1989. Over the course of time, the company has established four treatment platforms that provide a high level of success in the treatment of a variety of medical pathologies. The first platform includes musculoskeletal problems, sports injuries and spinal conditions. The second introduces a revolutionary method of wound healing that is effective in a timely manner. The third application is for the resolution of dermatological problems including psoriasis, eczema, acne, etc. 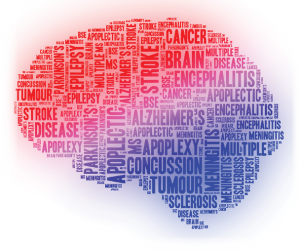 The most recent and exciting platform addresses the treatment of neurological conditions, focusing primarily on cerebral concussion, also known as traumatic brain encephalopathy. As we all know, cerebral concussion has become a major healthcare challenge, as the incidence of this condition increases, the result of high-level sports activities, motor vehicle accidents, military conflicts and episodes occurring throughout the course of daily activities. The negative impact on the quality of life and the stress on economic resources are incalculable. Many options are available to relieve symptoms and hopefully stimulate the healing process. Unfortunately hope, from a realistic perspective, does not produce results. In view of the limited therapeutic options currently available, aside from being only minimally effective or scalable on an encompassing basis, there is no single application that has provided consistent, effective relief. Reputations have been built on employing nutritional and/or exercise programs, neurofeedback and prescribing an extensive number of pharmaceuticals, the majority of which compound the problem, aside from the adverse effects induced by their addictive propensities. None of these methods provide a specific, curative effect to mitigate the pathology engendered by TBI. Symptoms generally include headaches, sleep aberrations, a complex array of cognitive and executive dysfunction, brain fog, fatigue and depression, all of which negatively impact the quality of life. Most of these symptoms may be imperceptible initially, however they generally become more evident as time progresses. This is the result of the activation of inflammatory pathways, both at the cellular and physiological level, which leads to deterioration of the neurons, axons, etc. One must be aware that neurodegenerative disorders, including the Dementias, Parkinson’s, etc. may often result from a traumatic episode at an earlier stage in the individual’s life which may have been long forgotten. It may therefore be inferred that aside from chronic pain and depression, more serious late stage degenerative conditions may also result from traumatic brain injuries sustained at an early age. The World Health Organization has recently published statistics indicating that 6 out of every 1000 individuals have sustained some form of concussion. 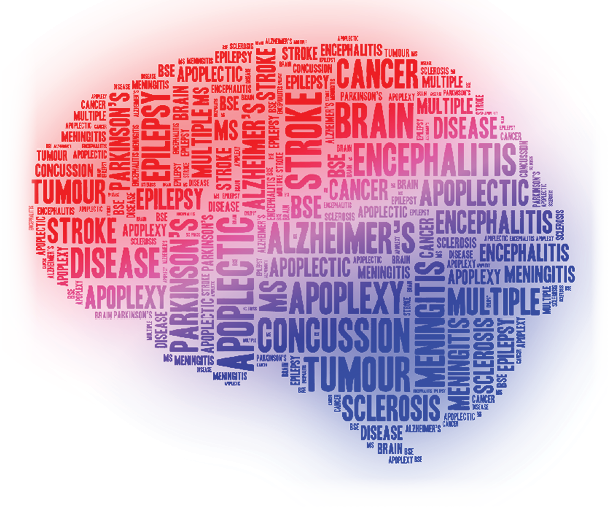 It is estimated that there are somewhere between 20-30 million North Americans living with TBI-related disabilities. This does not include the vast number of cases that go unreported. Efforts to improve the treatment outcomes should be a priority for all clinicians and healthcare providers involved in these endeavours. Once a diagnosis has been established, the therapeutic options are limited. Essentially concussion patients presently are prohibited from involvement in high-risk physical activities and demanding cognitive tasks. They are encouraged to rest and pharmaceutical solutions, often widely utilized, unfortunately do not address the underlying pathologies involved. At Meditech, over the past 10 years particularly, we have focused on the treatment of neurological conditions, primarily traumatic brain injury, as these cases present the largest cohort of neurological problems. Protocols have been developed specifically to treat both acute and chronic conditions which have been further divided into stable, labile and other categories. It must be observed that isolated injuries to the central nervous system alone are rare. A growing body of evidence indicates that the skeletal and soft tissues of the cervical spine, along with the spinal cord, may bear the primary brunt of the trauma. Aside from the torque and whiplash forces affecting the central nervous system, structures at the atlanto-occipital junction are exceedingly vulnerable to trauma. One should also be cognizant that the injury often includes the auditory and proprioceptive mechanisms. The brain stem, located at the posterior aspect of the brain, provides continuity with the spinal cord. The cranial nerves originate in the brain stem and when a traumatic episode occurs, physiological and neurochemical changes are manifested, leading to varying degrees of neuronal impairment. Neuroprotective functions are dependent on the viability of mitochondrial metabolism, which is essential to the process of cell survival and regeneration. Current research indicates that the effects of photobiostimulation consists of the primary effect, i.e. a direct photochemical change secondary to the excitation of photoreceptors and the activation of secondary messenger cascades with subsequent modulation improving function and gene expression. The secondary effect occurs at some point subsequent to light exposure. Impaired mitochondrial oxidative metabolism is associated with neuronal degeneration and this process is reversed with the application of Light Therapy. Therapeutic effects are actualized via three channels. The first is the direct effect of photon particles interacting with the membranes and intracellular molecules of the cells, constituting the neurological, connective and skeletal tissues that comprise the structures undergoing therapy. The second is the absorption of the photon or energy particles by the cerebrospinal fluid which are transmitted to the spaces surrounding the central nervous system, the ventricles and the spinal cord. The third is the humoral effect, i.e. the absorption of photon particles by the intravascular contents and distribution to the affected tissues. The circulation of both cerebrospinal and vascular fluids play a significant role in the actualization of this process. During 2016 at Meditech, we treated 500 cases diagnosed with cerebral concussion. The results achieved by patients that follow the prescribed therapeutic regimen in a compliant manner are well in excess of an 80% recovery rate. Protocols are continually refined and individualized based on extrapolations from our clinical experience and our extensive database. At this point, we feel that Laser Therapy is the treatment of choice for patients presenting with traumatic brain injury; moreover it offers a precise, consistent and universally effective therapeutic approach to the elimination of symptoms and the full restoration of quality of life. Modified treatment protocols have also been applied on a limited scale to Parkinson’s disease, Dementia, Autism and other neurological conditions. Results to date have exceeded our expectations and in some instances, have been dramatic. An early and better defined recognition of the diagnosis of concussion and the institution of Laser Therapy are paramount to the resolution of this and other neurological conditions in an expeditious manner. This entry was posted in LILT Developments on March 17, 2017 by Fred Kahn, M.D, FRCS(C). Today in medical practice, the focus on pain management exceeds the attention provided to the etiological factors that cause pain and other symptoms. Clearly the focus of the causative elements should be the focal point of research and therapy. The administration of measures to mitigate the pain often permits the pathology to become more severe to the degree that pharmacological and sometimes surgical solutions fail to contain the progress of the disease involved, along with the severity of attendant symptoms. At Meditech we recognized this paradigm many years ago and have always focused on the causative factors involved, rather than mitigating or masking symptoms. This would appear to be the logical approach, however one not followed in current medical practice. As a growing number of physicians present at our facilities for personal treatment, our practice is beginning to influence an increasing number of these individuals to become leaders of what we feel is a more rational and elegant approach to the treatment of pathologies, particularly when no proven or conventional method of resolution currently exists. Chronic joint pain, secondary to systemic, traumatic and degenerative causes, can be immediately and sometimes rapidly resolved with the application of Laser Therapy and without the production of adverse effects. Many surgeries, including joint replacements, exploratory procedures, etc. primarily to reduce the degree of pain, can therefore be avoided. This is particularly important in the approach to the treatment of back problems, again, a condition resulting secondary to a number of diverse factors. As we are all aware, the treatment of cerebral concussion (TBI) is receiving an immense amount of international attention and our therapeutic approach to this problem, developed and refined over the past decade, has become extremely relevant. Moreover, at this time we are pleased to state that we have developed an almost universally effective therapeutic approach based on the understanding of the brain anatomy, physiology and function. Our recently completed 26-page treatise on the treatment of the various categories of concussion is being more widely recognized at some university located concussion clinics as it delivers effective therapy devoid of any adverse effects. A number of organizations who have become aware of this technology are in contact with the principals at Meditech with the thought of establishing concussion clinics worldwide. Dr. Norman Doidge’s book “The Brain’s Way of Healing”, which resonates with so many physicians and patients afflicted with a diverse number of medical conditions, has stimulated an international response to his message which brings patients to our clinics in ever increasing numbers. Eventually logic will always prevail, despite the obstructions posed by insurance companies, regulatory bodies, governments and others who would pose impediments for reasons not always clear. Health care needs to change and Meditech, with its innovative solutions, is at the forefront of this sentinel movement. This entry was posted in Case Profiles, LILT Developments on February 19, 2016 by Fred Kahn, M.D, FRCS(C). The article below hopefully will permanently put to rest the inappropriate claims made for the efficacy of Class IV vs. Class III or IIIB Lasers. The article clearly delineates the controversy utilized in advertising these forms of Laser Therapy which creates significant confusion for begineers attempting to find their way in the field of Laser Medicine. Dr. Jan Tuner’s objective summary of this matter should clarify the facts involved and enable clinicians to make appropriate choices with regard to the therapy systems they acquire for optimal benefit to their patients. The use of low level lasers is increasing in medical applications. This treatment modality offers several advantages by promoting wound healing, reducing inflammation, edema and pain. But for those thinking about adding a low level laser to their clinic, it is wise to look for unbiased information before any investments are made. There are many different lasers on the market with different wavelengths, different combinations of wavelengths and output power. Most of these lasers are in the so called Class 3B, meaning lasers with a maximum power of 500 milliwatts (mW). Lasers with higher power are in the Class IV and having powers between 501 mW up to 15 000 mW (15 W) or more. The classification has nothing to do with the therapeutic effects but is solely based upon the risk of retinal damage. Which type of laser is then the best buy? To answer this question, we need to look at some facts. Manufacturers of Class IV lasers often claim that the high power increases the depth of penetration into tissue. This is not correct. Several of these lasers have a 980 nm wavelength, and the penetration of this wavelength is considerably less than that of the more conventional 808 nm wavelength. Since the penetration at 980m nm is poor, this means that there is more heat buildup at the skin. And laser phototherapy is not about heat but about photochemical reactions. As for the high power, it causes no increase of the penetration depth. The study by Joensen et al. showed a static depth of penetration of 810 nm over time. It is true that high power quicker produces more photons at the level of the maximum penetration, but this is not necessarily beneficial. Studies have shown that low doses and long time is more effective for the reduction of inflammatory processes , whereas high power and short time are inhibitory. Inhibition is actually a part of LLLT. By using high energies, the pain transmission in nerves is temporarily slowed down . This is a useful option in many situations of acute pain. But on the other hand, the inflammatory background of the pain is also inhibited and the actual healing is slower. Another aspect of the depth of penetration is the heat produced by strong lasers. This is particularly a problem in patients with dark skin or dark hair. The therapist needs to use a sweeping motion over the target to avoid pain. With a non-contact technique you lose upwards of 50-85% of the incident light through reflection and back-scattering from the skin , which means that only 15-50% of the light leaving the laser aperture is actually making it into the tissue. A Class3B laser does not cause any pain reaction due to heat, so it can be used with contact and with pressure. With contact, more light it forced into the tissue. And by using pressure, blood, being the main absorber of the light, is reduced in the area and the light can more easily penetrate the ischemic tissue. The pressure will also lead the laser probe closer to the target. Thus, a Class 3B laser can penetrate deeper into tissue than a Class IV laser and can therefore saturate the target faster. The heat buildup by Class 4 is negative and some manufacturers add cooling to the beam. Others offer pulsing to allow for heat dissipation. The latter actually lowers the energy, so the suggested advantage of the high power is contradicted. Proponents of Class IV lasers often claim that a larger area can be treated much faster. A cluster of Class 3B lasers can do the same thing and with the advantages mentioned above. The target area of physiotherapeutic problems is frequently rather small in size, but certainly often larger in chiropractic procedures. However, it does not necessarily take 15 W lasers to cover large areas. The goal of such therapy is to identify the precise locations of the problems and to apply a sufficient energy to that area, rather than to cover a large area and hope for the best. Manufacturers of Class IV lasers frequently make references to the literature. Remarkably, these references are generally Class 3B studies. The Class IV studies are still few and sometimes surprisingly biased. One paper (5) claims that Class IV laser produced better healing of oral mucositis than “a standard Class 3B laser”. But the “standard Class 3B laser” turned out to be a very weak laser pointer. 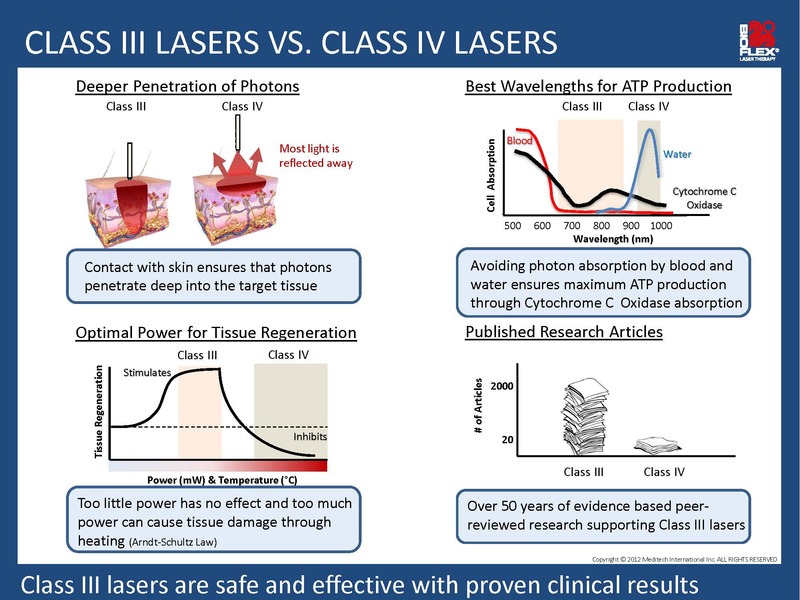 There are still no studies where the effects of traditional Class 3B lasers have been reasonably well compared to Class IV lasers. Class IV laser manufacturers often claim that this type of laser saves time. It ain’t necessarily so, as Porgy sings. In the epicondylitis study by Roberts (6) the time spent was 5 minutes. Using a 3B laser in firm contact over tender points and a sweeping motion over the actual condyle (being very superficial), sufficient energy at the targets can be applied in 2-3 minutes. The authors swept over an area of 45 cm2. By spreading the light over a large area, using a wide beam area and irradiating from a distance, the dose became 6.6 J/cm2 and the power density only 22 mW/cm2, which is very low. So in spite of using 10 000 mW and an energy of 3.000 J, the power density was low and the time long. This shows that high power does not necessarily save time. In the study by Kheshie (7), Class 3B and Class IV lasers are compared in their potential efficacy on knee osteoarthritis. At least that is what the authors and the average reader would believe. However, this is another case of apples and oranges. The “high intensity laser” disperses its light over a large and not well defined area, but quite large. If supposed to be 100 cm2, the intensity would be in the level of a regular LED, 15-25 mW/cm2. Hardly within the known therapeutic window. In comparison, a 3B cluster of 4 x 200 mW laser diodes with small apertures (= high local intensity) is held over the patella. Not a very good approach for knee OA, but what is worse is that the laser was held stationary for 30 minutes! This is bioinhibition, for sure! (Around 1500 J over a knee). The conclusion of the abstract is: “HILT combined with exercises was more effective than LLLT combined with exercises, and both treatment modalities were better than exercises alone in the treatment of patients with KOA.” Yes, obviously, and two inadequate protocols managed to result in positive outcomes. Says something about the potential of LLLT. But it says nothing about any advantages of Class IV over Class 3B lasers. And the flaw cannot be identified in the PubMed abstract due to shortcomings in the reporting of parameters. Summing up, any Class IV laser used within its limitations can be a positive addition to a clinic. However, there are several therapeutic limitations and a suitable Class 3B laser can do whatever the Class IV laser can, and at a lower cost. Low level laser in itself is very rewarding, so keeping to the facts should be enough to impress any customer. Joensen J, Ovsthus K, Reed R K, Hummelsund S, Iversen V V, Lopes-Martins R A, Bjordal J M. Skin Penetration Time-Profiles for Continuous 810 nm and Superpulsed 904 nm Lasers in a Rat Model. Photomed Laser Surg. 2012; 30 (12): 688-694. Al Watban FAH (1996) Therapeutic lasers effectiveness and dosimetry. Biomedical Optical Instrumentation and Laser-Assisted Biotechnology, NATO ASI Series E Applied Sciences, Vol 325, 171-183. Ottaviani G, Gobbo M, Sturnega M, Martinelli V, Mano M, Zanconati F, Bussani R, Perinetti G, Long C S, Di Lenarda R, Giacca M, Biasotto M, Zacchigna S. Effect of Class IV Laser Therapy on Chemotherapy-Induced Oral Mucositis: A Clinical and Experimental Study. Am J Pathol. 2013; 183 (6): 1747-1757. Roberts D B, Kruse R J, Stoll S F. The Effectiveness of Therapeutic Class IV (10 W) Laser Treatment for Epicondylitis. Lasers Surg Med. 2013; 45 (5): 311-317. Kheshie A R, Alayat M S, Ali M M. High-intensity versus low-level laser therapy in the treatment of patients with knee osteoarthritis: a randomized controlled trial. Lasers Med Sci 2014; 29 (4): 1371-1376. This entry was posted in Case Profiles, LILT Developments, News on February 5, 2016 by Fred Kahn, M.D, FRCS(C). One must always be cognizant that nature and time combine to heal many pathologies, particularly if there is no secondary interference. Many therapies currently utilized to promote healing actually obstruct this process. When healing does occur it is often ascribed to whatever modalities or technologies are applied and we point out this erroneous line of reasoning. Allowing the body’s natural proclivities to heal, along with rest, are essential to the resolution of many disease processes, the majority of which are denoted by an inflammatory process. Exercise, pharmaceuticals and other inappropriate therapies are often counterproductive to the efforts required to achieve healing in many pathological situations. Medications mask symptoms and do not address the causative factors and along with many other therapies which may be contraindicated, encourage conditions to become chronic or “stall” the healing process. This has been proven by introducing the standards of evidence-based medicine and also understanding the neuroplasticity of the brain, which is increasingly stressed in the up to date literature. 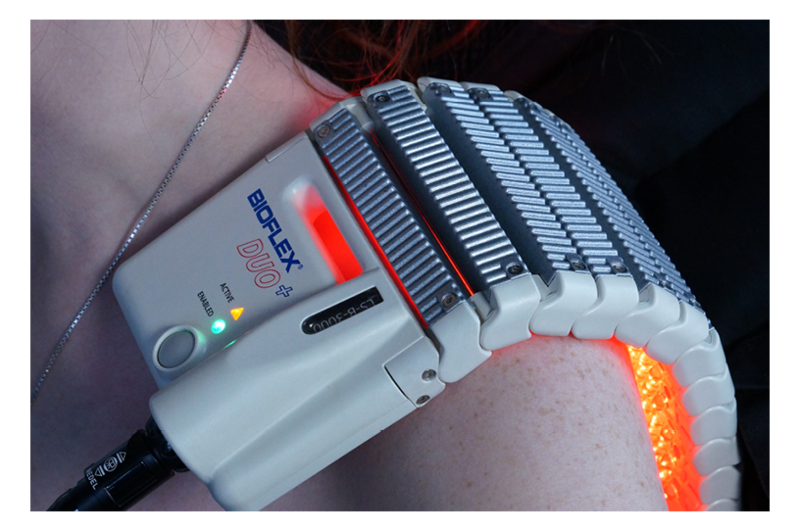 BioFlex Laser Therapy Systems are specifically designed to resolve causative factors which produce symptoms and work in conjunction with nature’s ability to achieve that end. In our culture of instant gratification and the inappropriate influences of advertising, many therapists are advised how to promote healing, although many of those recommended methods may actually disrupt the homeostatic status or at best, prolong the duration of the particular disease involved. Again, it should be noted that Laser Therapy Systems work in conjunction with nature and the control of environmental factors that may often be an impediment on the road to healing. Degenerative osteoarthritis, a common condition with its accompanying chronic/acute pain patterns almost genetically imprinted, the so-called “non-healable ulcer” of an extremity of many years duration, spinal stenosis which may often confine patients to their beds for prolonged periods of time and a host of other problematic conditions are generally resistant to the majority of technologies applied today — the reason, they are directed to reduce the severity of symptoms, rather than addressing the resolution of the pathology responsible for these sensations, such as pain. Over 50% of the conditions treated daily at the Meditech Clinics consist of these types of problems and in over 90% we achieve relative cures in a short period of time. One must realize that this cannot be accomplished by treating the economically dictated 5, 10 or even 15 minutes, except in instances of minimal to moderate type lesions. Not only is the duration of significance but also the development of scientifically developed protocols that withstand the scrutiny of evidence-based practice. Therapy must be applied for each individual condition in a somewhat controlled manner in order to produce consistent positive results; this recalls the dictum that one size does not fit all. Duration of treatment must relate to the chronicity of the condition, the extent of the pathology and the consideration of many other factors including activity levels, the environment, etc. It is interesting to note that misleading advertisements in the laser industry often claim that Class IV lasers, as opposed to Class III devices, penetrate deeper, require only milliseconds of application, heal faster, etc. ; nothing could be further from the truth. Not only are these statements incorrect but they have never been supported by any scientific evidence. If lesions do heal, in some instances this unquestionably is the result of the body’s natural healing mechanisms and the passage of time and probably more expeditiously than with the introduction and interference of so called healing modalities. Unfortunately misleading and false advertising, so common in our culture, does not refer to the many aspects of therapy required to resolve any particular medical problem i.e. the individualization of each pathological process, the application of the correct protocols including the duration of treatment required for resolution. Understanding the Science of Laser Therapy, the pathological changes and the physiology of the cells are guidelines that must be carefully considered with regard to each individual patient’s condition. This entry was posted in LILT Developments on April 10, 2015 by Fred Kahn, M.D, FRCS(C). Arthritis can be a severely debilitating and painful disorder that affects 4.5 million Canadians aged 15 years and older. Translated into simple terms, it affects 1 in 6 of our citizens. Unfortunately, conventional therapies including analgesics, biologics, surgery and over the counter remedies provide limited long-term benefit in addressing the underlying pathology and symptoms of this condition. Laser Therapy, an emerging technology approved by Health Canada, is highly effective in relieving the symptoms of arthritic pain and rapidly increases the patient’s mobility without the utilization of any medications. Moreover, there are no adverse effects associated with the application of this therapy. At our Meditech Laser Rehabilitation Centres, we have consistently achieved significant improvement with regard to the symptoms of arthritis involving the spine, knees, shoulders, hands and other joints. Laser Therapy is non-invasive, pain-free and provides the most potent anti-inflammatory effect known. In addition, it acts as an analgesic but most significantly, it promotes the regeneration of new cells, replacing those that are functioning at subliminal levels. Fifty years of published research supports and validates that this therapeutic option is more effective than traditional approaches currently in vogue and should therefore be more widely utilized by healthcare professionals and patients seeking effective alternative solutions. The dissemination of education with regard to Laser Therapy is paramount to increase patient and clinician awareness of the technology. As a final comment, it is our experience that this is the most effective therapeutic solution to resolve the challenges presented by arthritic degeneration. This entry was posted in Case Profiles, LILT Developments on September 10, 2014 by Fred Kahn, M.D, FRCS(C). One of the key elements at Meditech clinics is that we are always receptive to patient comments. Unfortunately pain, once it has become established, does not cease on Saturdays, Sundays or Holidays. It is for this reason that our clinics are open 7 days each week, with the exception of the 11 statutory government designated holidays, which dictate that we are not allowed to be open. So much for government intelligence levels and regulations. Most important of all, patients are always greeted in a positive manner and are not required to apologize for being late or other insignificant matters. Pain, although characterized in many ways by the pharmaceutical industry, is a symptom that is generally unrelenting. For purposes of advertising, drugs are prescribed for breakthrough pain, night pain and other descriptive terms. This is erroneous as pain is simply just that – “pain”. Moreover, it is even more important to understand that pain is only a symptom, not a disease. At our clinics we therefore focus on curing the pathology or the clinical condition that causes the pain, rather than masking the symptoms, which is a significant aspect of this equation. We are less concerned with pain management than eradicating the cause responsible for the symptoms. With Laser Therapy this can be accomplished sometimes after 1 or 2 but generally over a course of 8 -30 treatment sessions. The administration of Laser Therapy also requires determining the correct dosage or therapeutic protocol that will produce the optimal effect in that particular individual. This includes the appropriate combination of LEDs and laser diodes applied for each specific condition. The parameters that must be considered in order to develop specific protocols include the frequency of the pulse, duty cycle, wave form, wave length, duration and other modulations of the laser light source. The guidelines to that endeavor are dictated by the patient’s response to symptoms, based on the genetic makeup of the patient’s cells, the sensitivity to light of the individual cells, etc. These factors are all of considerable importance. Unlike drugs where one dose appears to fit all, Laser Therapy is adjusted for the individual patient, taking into account the many factors involved; these include the patient’s dermal pigmentation, adipose tissue content, chronicity of the disease, etc. Again, unlike drugs, one size does not fit all but must be carefully and creatively calculated for each individual patient and those not responding to standard protocol settings. The subtleties of in this therapeutic approach are guided by observation, clinical change, both subjective and objective, and the general and specific effects produced. The resulting outcome is dependent on and correlated with careful attention to these details. Simply shining laser light on to the tissues will bring benefit calculated from 20-60% but giving proper attention to the many factors involved, can potentially achieve a 100% cure rate. This approach may not be as simple as writing a prescription, which although in many instances can be effective, generally does not provide a permanent solution. Laser Therapy on the other hand is able to achieve a relatively complete resolution of medical conditions where its use is correctly applied, in over 90% of all cases treated. This entry was posted in LILT Developments on May 26, 2014 by Fred Kahn, M.D, FRCS(C). Although these devices are currently highly touted by individual manufacturers and their paid proponents, they need to be regarded with a critical eye. First of all, these systems operate at high energy levels and may therefore be bioinhibitory and I quote the Arndt Shultz Law which states that a small dosage of light may have no biological effect, a moderate dosage may have a biostimulatory effect, and a large dosage may have a bioinhibitory or even cytotoxic effect. Moreover, Class IV devices do not reduce the severity of the inflammatory process so essential to therapy and do not accelerate the regeneration of individual cells. Indeed in review, they have proven to slow wound healing and accordingly their advertising hype never mentions the healing of wounds. It should be observed that the healing of wounds does not differ from the healing of other tissues, notwithstanding the existing degree of pathology. The generation of the heat imposed also detracts from the effectiveness of therapy. Wavelengths from the 900-1000 level are primarily absorbed by lipids and water and therefore have minimal effect on the cells involved in the pathological process. Once again, it should be noted that Class IV Lasers are not applied directly to the tissues because to do so would cause burns using the high powered settings recommended. The 980 nm diodes incorporated in Class IV Lasers do not increase penetration, as much of the light energy is absorbed superficially and more rapidly, leading to heat generation. This diminishes the physiological benefits so essential to cellular activity. It should be noted that Tuner and Hode, who have a good grasp of the physics of laser light, do not recommend Class IV Lasers and state that Class IIIB devices, properly engineered, are most appropriate for cellular healing (excerpted from an article, “No Cure from LiteCure” by Jan Tuner). However Lasers may be classified, whether Class II, III or IV, it is an extensive combination of factors that are essential to promote cellular healing and the production of optimal clinical outcomes. These include malleable parameters such as pulse frequency, duty cycle, waveform, wavelength, energy density, duration, etc. The diodes utilized must be minimally degradable and applied directly to tissue to achieve maximum benefit. The benefits derived from Class IV Lasers generally, removed some distance from the tissues and covered by either a plastic or glass protective barrier, are negatively affected by the refraction of light as it transverses the atmosphere and reflection as it strikes the epidermal surface. While curtailing the so-called benefits of higher powered lasers, the degree of power cannot be accurately determined and effects on tissue will therefore be random, unpredictable and potentially produce serious adverse effects. This entry was posted in Case Profiles, LILT Developments, News on May 21, 2014 by Fred Kahn, M.D, FRCS(C). Patients who have been involved in a motor vehicle accident (MVA) will probably experience symptoms secondary to intracranial and cervical trauma immediately or at some point subsequent to the episode. Injuries relating to the thoraco-lumbar spine and the joints in the lower regions of the body are generally less common in this type of trauma. Most frequently, MVAs are responsible for injuries to the cerebral hemispheres, cerebellum, brainstem and cervical spine. In cases where the vehicle is struck from the rear, the accident victim may experience a whiplash-type injury as the neck is abruptly moved forward at the time of collision and then rapidly moves posteriorly, the brain striking the cranium during the process. All the soft tissues in the neck and upper body, including muscles, ligaments and nerves, etc. may also be damaged during this event. Along with the invariable soft tissue injuries, concussions of varying degrees are a common result of motor vehicle accidents. The latter can cause multiple symptoms to occur at the time of, or long after the accident, often unrelated to the severity of the degree of trauma, even when the patient may not have lost consciousness. In summary, whenever an external force injures the brain through direct impact or via the acceleration/deceleration forces, symptoms invariably result at some point in time. In addition to the initial damage at the moment of impact, brain trauma may be accompanied by secondary injuries in which a series of events take place immediately following the event or many weeks or months subsequent to the initial trauma. Reduction of cerebral perfusion, with decreased oxygenation of the hemispheres, edema and elevated intracranial pressure – all contribute substantially to the damage resulting from these episodes. Symptoms of TBI are both diverse and complex. They vary with the degree of injury and can be termed mild, moderate or severe. Again, delayed onset is not uncommon. Complaints frequently noted include headaches, pain and stiffness of the cervical spine, dizziness, nausea, vertigo, fatigue, light and sound sensitivity, visual disturbances, general apathy, amnesia, emotional lability (crying, talkative), cognitive impairment (slow reaction time, memory loss) and most significantly, loss of mental focus and concentration. Over the past 40 years, Laser Therapy has been increasingly and effectively utilized in the treatment of both acute and chronic musculoskeletal conditions, including degenerative disc disease, repetitive stress injuries, ligament and muscle strains, tears, etc. The technology is a non-invasive, light-based therapy that uses a combination of red and infrared light in the form of superluminous light-emitting and laser diodes. The power output of these devices is significantly below the level of ablative high-intensity laser devices. Particles of energy, known as “photons”, are emitted from the diodes and absorbed by the cell membrane, numerous molecular components within the cell, the mitochondria, etc. Ultimately this process stimulates cellular metabolism in the damaged tissues. Moreover, it resolves inflammation and accelerates the healing process, resulting in the elimination of pain. In instances where trauma is the dominant factor, injuries of the brain and cervical spine are frequently overlooked. As the brain stem transits the atlanto-occipital junction providing neurological connectors between the cerebral hemispheres and cerebellum to the peripheral areas of the body, the inflammation and compression which may be produced, results in symptoms. The central nervous system is pivotal in maintaining consciousness and regulating involuntary functions such as the sleep cycle, heart rate, breathing and metabolism, which are affected when trauma occurs. Traumatic brain injuries and cervical dysfunction often produce concomitant pathologies. Many articles have been published describing the benefits of Laser Therapy in the treatment of acute and chronic cervical pain. Laser Therapy applied to the cervical spine and other associated structures which may be affected, brings significant benefit. The mechanism of action involves irradiation of the cerebrospinal fluid, increasing arterial perfusion of the cerebral hemispheres and provides a potent anti-inflammatory effect, all of which reduce the symptoms caused by both the initial and delayed effects of the injury. A 64-year-old woman presented with post-concussion syndrome 10 years subsequent to an MVA. She experienced a number of symptoms following the accident, including cognitive impairment, visual disturbances, headaches, dizziness, fatigue, irritability, numbness/tingling, emotional instability and sensory deficits. She was also experiencing severe pain in the cervical and lumbar spine, including right-sided sciatic pain which she described as “knife-like”. A course of Laser Therapy was administered over a period of eight weeks over both areas. During this period, no other therapy was being administered. The patient’s pain levels steadily decreased over the course of this period from an initial score of nine out of ten down to a three out of ten. A number of neurological symptoms that she had initially rated in the severe category were reduced to mild or non-existent levels. These included dizziness, fatigue, emotional lability, feeling mentally foggy and having difficulty concentrating. Laser Therapy is a proven, highly effective treatment for an extensive range of musculoskeletal and neurological conditions. Whereas ongoing research continues to increase our ability to develop appropriate treatment protocols, we have observed that significant benefit can result in individuals who have sustained an MVA. We feel that this approach has unlimited potential in treating these disease entities and are carrying on extensive research in this area. To date, our experience has produced positive results beyond our expectations. This entry was posted in LILT Developments on May 16, 2014 by Fred Kahn, M.D, FRCS(C). All diodes have a finite lifespan, as do all devices whether medical, automotive or other products. This directly relates to the hours of utilization, much as in human bodies where excessive activities, particularly in athletes, leads to early arthritic degeneration. Fortunately at this time we have been able to find a diode manufacturer who has been able to design custom diodes to meet our specifications. These have been installed in all new equipment since November 2013 and will be the standard for all new devices manufactured at Meditech. For this reason arrays built subsequent to November 2013 will no longer require calibration. The diodes that we are currently installing in all our BioFlex Systems typically exhibit minimal degradation. In older equipment with 5 years of heavy use or 8-10 years of moderate use, consideration should be given to replacing arrays in order to provide optimal patient outcomes. Again, with the new arrays, minimal degradation occurs and the lifespan of the diodes has been extended to 10 years plus, even with heavy utilization. This entry was posted in LILT Developments on May 15, 2014 by Fred Kahn, M.D, FRCS(C).